The Dordogne is the southwest region of France along the Dordogne River. It was once referred to as the Perigord from the time of the Gauls through the Hundred Years War between England and France in the 14th and 15th centuries. There are still remains of hundreds of castles from that period. 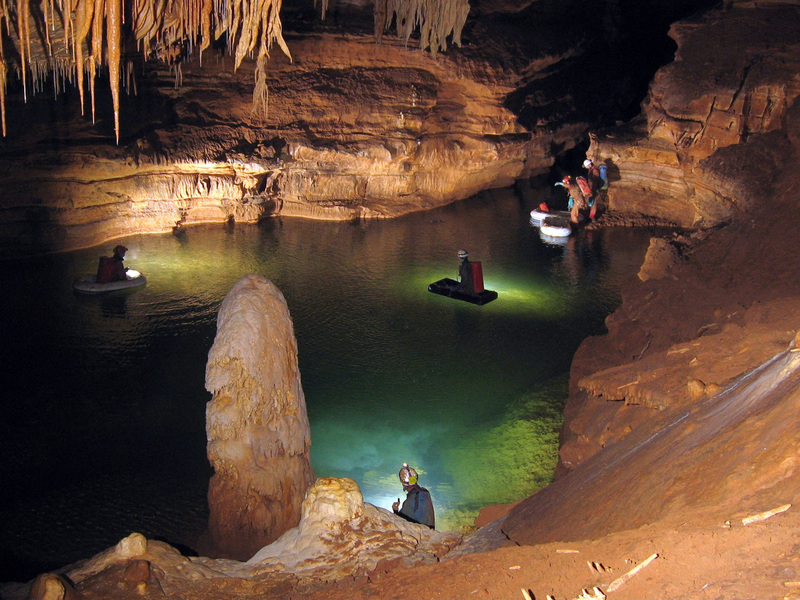 This is also the greatest concentration of prehistoric caves in France, mostly centered around the town of Les Eyzies, Lascaux being the most famous and Font du Gomme being the most accessible. The Dordogne is also the Foie Gras capital of France. France produces close to 80% of the world’s Foie Gras and 90% of that production come from the Dordogne. Our rental house sits up on a hill directly above the small village of Le Buisson. Le Buisson is usually a very quiet little town, but in August there are festivals throughout the country and for the past 2 nights we’ve been serenaded by French Rock Bands playing classics like “Louie Louie” and “Woolly Bully” well into the wee- early hours of the morning. 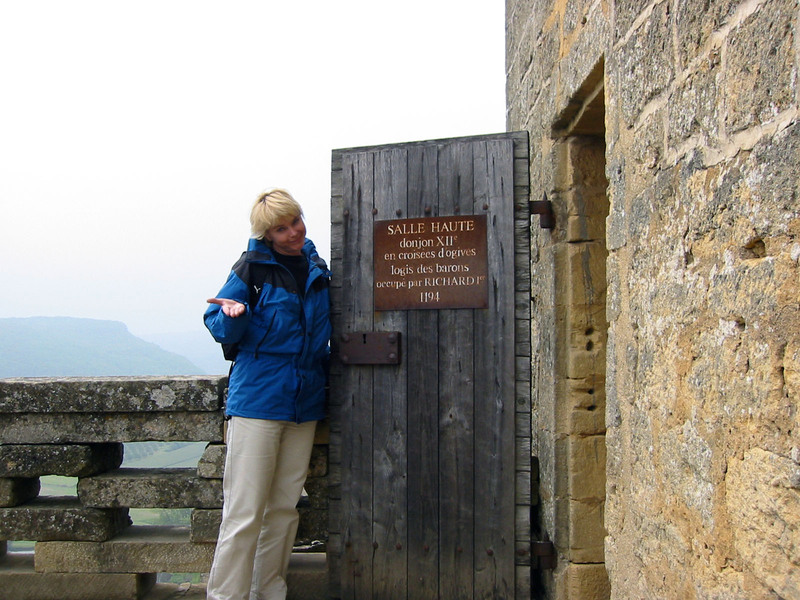 Our guide, Patricia Poisson (who we call Patty Fish) was certified by the Board of Tourism to guide us through the Dordogne. She is pleasant, English (with a voice reminiscent of old radio broadcasts of the Queen ), +65 years old, and although she was very helpful is giving us an education in Foie Gras, she really had little else to offer us beyond our information from the tour books and the local guides in the Prehistoric caves. Ah yes, the prehistoric caves. There are lots of them buried around here. The bears died out 12,000 years ago but the cave painters who came in 4,000 years later used the scratches to embellish some of their art. Rouffiniac was home of the woolly mammoth, and, along with bison, horses and reindeer, we saw lots of them painted and engraved into the walls. 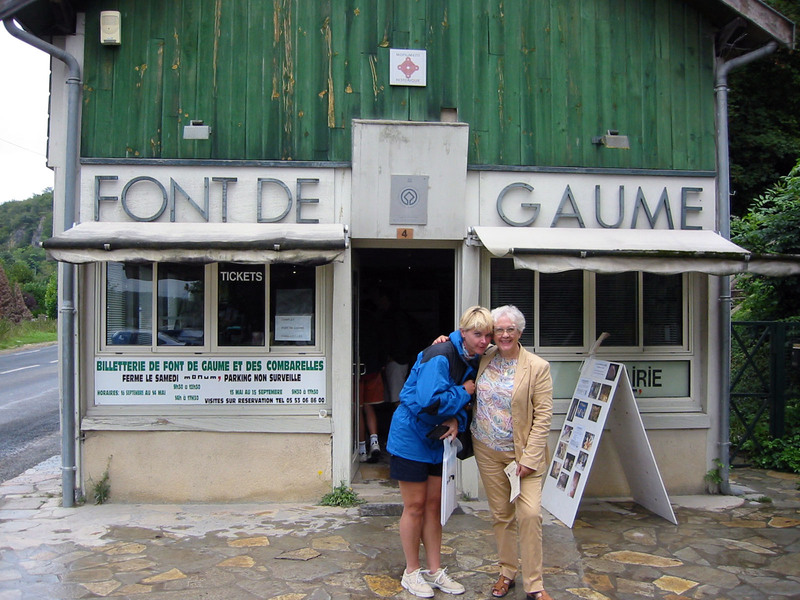 Next stop, Font De Gomme, the second best cave in France after Lascaux. Since Lascaux is now closed to the public, Font de Gomme is the only place where you can see actual cave art this perfect. Only 200 people are allowed per day and the tour is only 90 minutes, short, but enough time to see a bison in 3/4 perspective and the expressive drawing of a stag tenderly licking a doe. And then there was the Bison Chapel, most amazing. We finished our day at Domme, the chaotic French Bastide town built high up on a hilltop. This grand fortress of Domme was only sacked once in history. Twelve Hugonots scaled the cliff, banged on a lot of pots and caused the town to frantically run to the main gates to see what the matter was. When they opened the gates, guess who was outside waiting to get in. You guessed it, the Hugonot army. Today, this little bastide is another stop on the tourist trail, complete with souvenirs, foie gras, local wines and lots of cafes. We stopped into one of the shops and Patricia instructed us in the art of buying Foie Gras “Entier”, the purest variety. We came home, opened a bottle of wine and although I nearly popped an eye out trying to open the glass jar , we rejoiced in what was the 1st of many jars of foie gras. 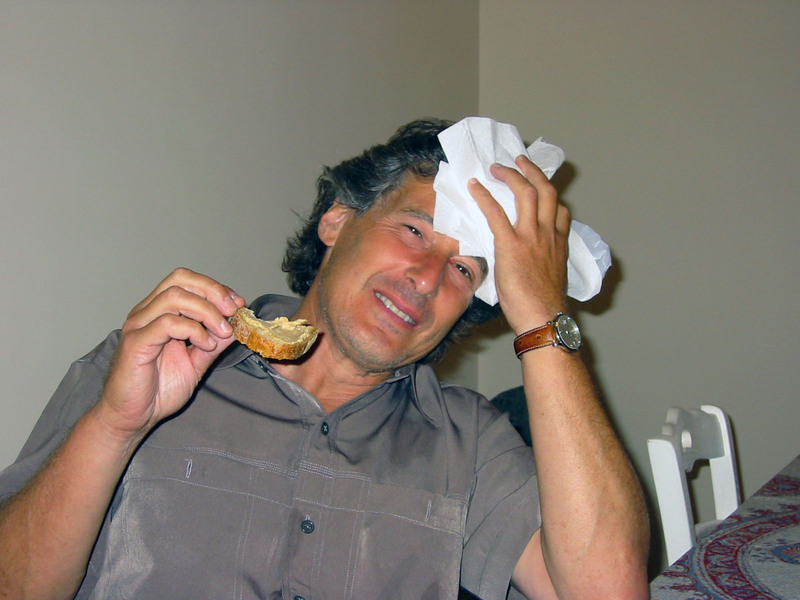 The glass shard bounced off my forehead and although there was a lot of blood, no real harm was done. Rain… Check the internet weather forecast. More Rain…Drop off the trash at the recycling bins in the rain…Drive to Perigeaux in the rain. Arrive to the medieval center of the city and everything is closed with the exception of a few bars, a few pastry shops and a handful of souvenir shops selling (of course) umbrellas. We stroll the old streets and at 12:05pm we eventually make it to the old Eglise St Front, a beautiful Byzantine style church of many domed cupolas, but the church is closed from 12noon till 2;30pm. We purchase some foie gras from one of the open shops and return to the car. We’ve been eating a lot of foie gras. Drive through Bergerac. Yes there is a statue of Cyrano De Bergerac but we never saw it. Yes, there is a Museum of Tobacco but smoking in the museum is not allowed. Tobacco is one of the big crops of the Dordogne. The blonde tobacco was famous for the Gitane and Galouse cigarettes but since most of the French now prefer American brands, we don’t really know what the tobacco is used for these days, but there still is a lot of it growing in the fields. 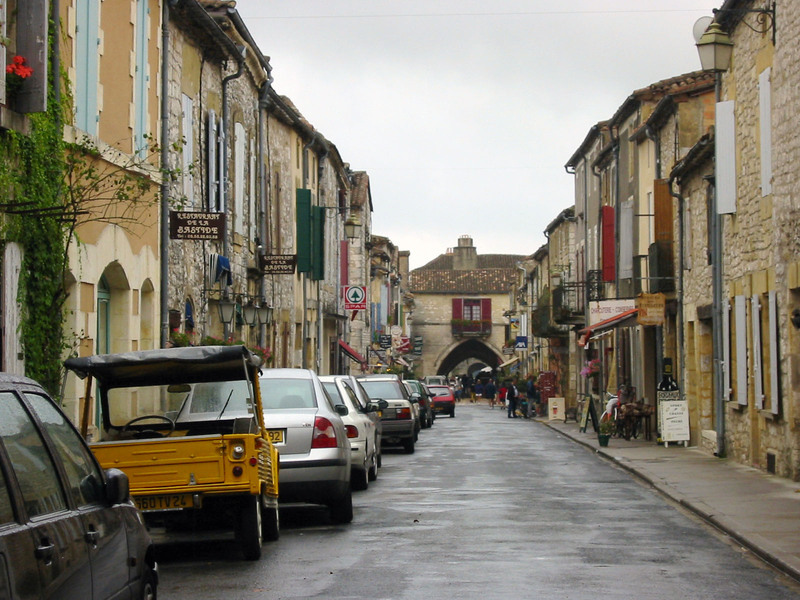 Drive to the village of Monpazier, a beautifully organized 12th century bastide town, but it is Monday, and everything is closed. And it’s still raining. As an example of a fortified city, we are very confused. Monpazier is situated in the lowlands with no views, no protection and no reason to build a fortified town. We obviously missed something. Drive to Chateau Biron. An enormous Chateau that began in the 12th century and was added onto in the 13th, 14th, 15th, 16th and so on. We even noticed a 21st century childrens playground on the property. Oh, an interesting note; the Chateau Biron was related to Lord Byron. However, we have no knowledge of Lord Byron ever visiting Chateau Biron. Back to the car. On past the medieval hilltop village of Belvés to the Intermarché at Sirouac de Perigord (our local market). After restocking water, bread, yoghurt and cereal we come back home. The rain has temporarily stopped. It really does take almost 2 hours to get from le Buisson to Rocamadour, almost three hours if you stop for a coffee and short walk up into the cliff houses of La Roque Gageac. The parking of Rocamadour sits on an open field overlooking a cliff. 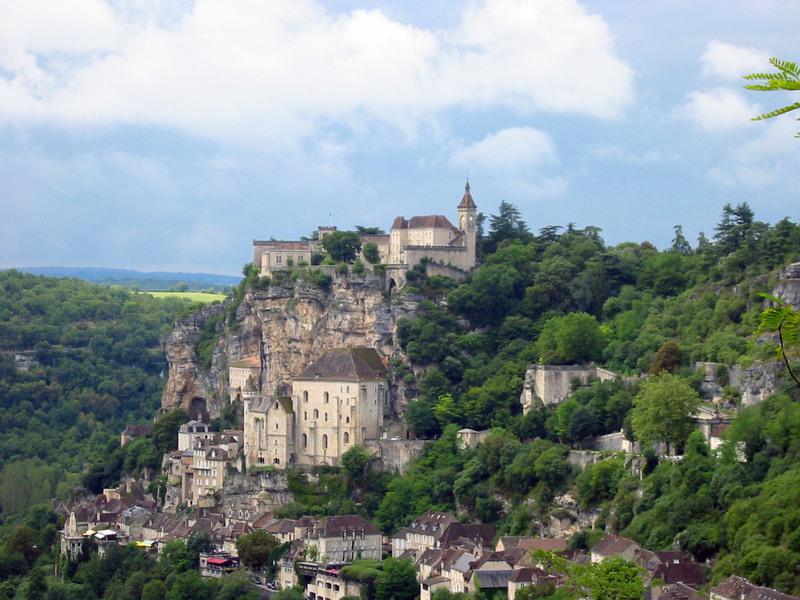 The Fortress town of Rocamadour is built onto the cliff. As the story goes, Roland, the hero in Charlemagne’s war against the Moors, was mortally wounded in battle in Spain. As he is about to die, the archangel Michael appears to him, and in order to make sure takes Roland’s sword, the legendary unbreakable Durandel, doesn’t end up in the hands of the enemy, he throws it over the Pyrenees where it lodges itself into the cliffs of Rocamadour. 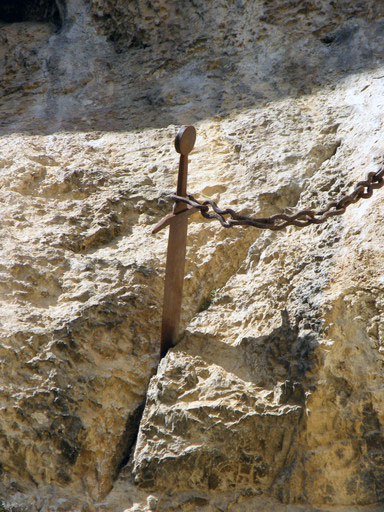 Yes, the sword has been there, lodged into the rock cliff since the 8th century (or at least a version of the story) protruding from a crack in the stone cliff, chained to the rock to deter the thieves. More about the thieves later. The devout make a pilgimage to Rocamadour to pay their respects to the black virgin who is responsible for some great miracle (I never found out what it was). Today though, most of the pilgrims have been replaced by the tourists who come for the beautiful views and the tourist shopping. After avoiding the Foie Gras tins, the little toot toot train full of tourists and various other souvenir shops, we ducked into a restaurant for lunch. Then onward and upward we made it past 6 of the stations of the cross before finding a short cut. To think, the pilgrims used to go up the mountain path on their knees. 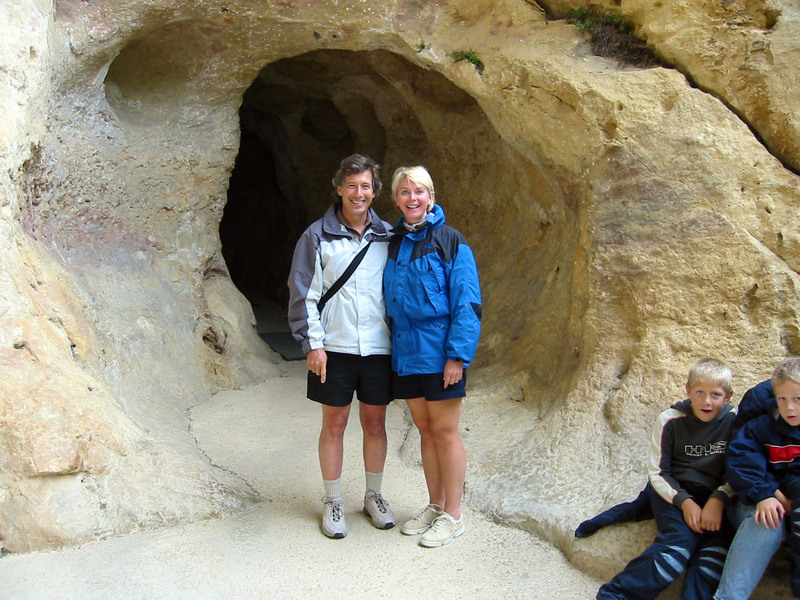 It is a 20 minute drive to the Gouffre (cave) de Padirac. Once again, lots of cars so we find a space towards the back of a parking lot/converted field. After a 45 minute wait in line for tickets, a 20 minute walk down the 180 meters below ground and another 15 minute wait to get into a boat to cross the underground river with Charon the boatman, we arrived into the large subterranean gallery. Leaving the boat, we went for a 45 minute guided tour of underground lakes and the biggest, fattest stalagmites and stalagtites I have ever seen. The calcium deposits grow at a rate of 1 cm per year and everything is covered, even the man made light covers and tool sheds. It is quite impressive and very other worldly. The crowd at Padirac was a lot rougher and tougher than we had seen in any of the other tourist attractions. It almost looked as if Neanderthal man didn’t go extinct, and it’s descendants were now making the pilgrimage back to their ancestrial home. Gretchen gave me the look of “try not to feel so superior please”, but those thoughts came back to haunt us when we returned to the car and found it was broken into. Amazing that all it takes is a good whack on the door lock and the door pops open. But what was really amazing is what was not taken. The contents of my carrying pouch were emptied and with the exception of a small butane lighter and a spare camera battery, a French phone card and a pacquet of kleenex, everything else was put back; my passport, the registration to the car, the spare key to the car and some cigars. Gretchen’s wallet was still in the glove compartment, complete with all of her credit cards and over 250 euro in cash. I guess French thieves don’t consider the glove compartment a place to put valuables. They did grab the 2 bags that were in the trunk which contained Gretchen’s camera, her pocket knife, a zenon flashlight and an assortment of clothing we had put aside for the day in case the weather changed; shoes, shorts, sweat pants, etc. Oh yes, they also took an english-french dictionary, just in case they need to look up the words “inconsiderate thieving bastards”. We called the police who directed us to come to them in the small town of Gramat, about 12 km down the road to file the report. No matter how confident you feel about speaking a foreign language, the real test is in filing a police report to policemen who don’t speak any other language but French. Lots of picture drawing, lots of head nodding, scalp scratching and shoulder shrugging, lots of spelling the words out on paper. However, with his very few words of English, our detective, Jules Vanderbeken was able to ask us if the uniforms of the police in San Francisco have changed. We were confused. Maybe we misunderstood him, but we told him that the SF Police still wore the same uniforms. Maybe he saw a couple of “Dirty Harry” films here in rural France. At any rate, it seemed to satisfy him and he went back to his French questioning. An hour and a half later, we left the Gendarmerie with a police report and the solid reassurance that we would never see any of our possessions again. This is the second time we have purchased trip insurance. The first was last year when our travel was postponed due to the tragedy of September 11th. 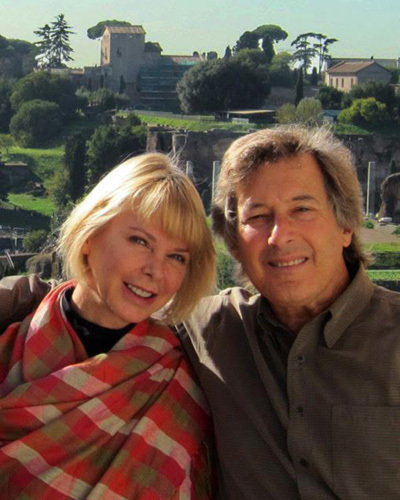 We were paid back all that we lost in unused time in our Florence apartment as well as unused time of our car lease. When I called the travel insurance company last night, they told me we should be covered for the items stolen. Now it’s on to the adventure of repairing the car door on the leased Peugeot. Somewhere between our car being broken into and the annoying rain that hangs around like an uninvited guest, our love of the French countryside is beginning to fade. Any hopes of canoeing down the Dordogne and floating past the beautiful chateaux disappeared with the sun. And even though it was still the height of the tourist season, every town we entered seemed deserted of visitors. Even the locals suffered from the heavy gravity. We decided to visit the two military chateaux of Beynac and Castelnaud, opposing strongholds on opposite sides of the Dordogne River. Beynac was the French outpost, Castelnaud, the English. Both still sit imposingly atop mountain peaks of the Dordogne, taunting each other to this day. 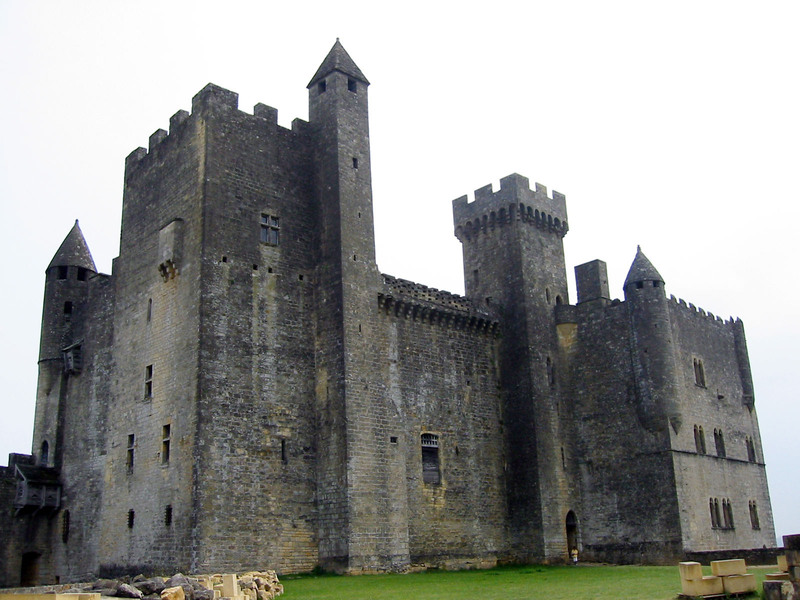 We parked the car outside the protective walls of Beynac, walked into the castle village and up to the Chateau. The French owner has taken great interest in restoring the castle to it’s original condition, complete with military dining halls, indoor latrines, great halls and the donjon where Richard the Lionheart spend 10 years from 1189-1199. He also received a little financial help from the film director, Luc Besson who used the Chateau in his Joan of Arc film “The Messenger”. We stopped at a restaurant outside the gates for a lunch of roast pork in prune sauce (the restaurant was about to close and this was all they could offer) and when we returned to the car, you guessed it. Hit again. Since the door lock was already pushed in, it apparently didn’t take much of an effort for the thief to push it in a second time. This time though, we’d taken everything out of the car except Gretchen’s sunglasses and the CDs in the glove box. The sunglasses were gone, but once again, the glove compartment wasn’t opened. Either the same thief was following us around the Perigord, or all the thieves in the Dordogne feel that it is a waste of time to check the glove box. A footnote to this theory. Leaving the Dordogne, we drove across France and enjoyed a night at the Abbaye de Sainte Croix, outside of Salon de Provence (another old catholic abbey turned into a beautiful hotel). As one of the staff was helping us remove our remaining bags from the car, we told him about the robberies in the Dordogne. He then told us about his uncle, who has the exact same Peugeot 406. 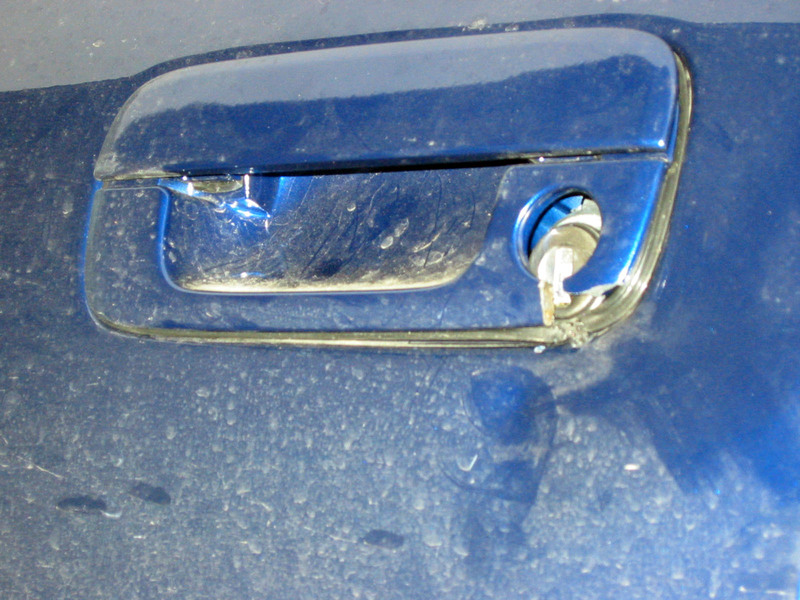 The uncle discovered (the hard way of course), that all one has to do is throw a tennis ball to the left of the lock on the trunk and the trunk lid pops open; and then closes again as if nothing had happened, except all the contents inside the trunk are gone. This trick must be in the Thief Manual for Peugeot cars.